2017-18 SEASON: Played in 42 games during his rookie campaign with Orlando, averaging 4.2 ppg. and 4.3 rpg. in 13.8 minpg.…Ranked among all NBA rookies in rebounding (T-11th)…Led (or tied) the team in rebounding six times…Scored in double figures eight times, including a career-high 13 points on Apr. 11 vs. Washington…Pulled down a career-high 12 rebounds on Apr. 8 @ Toronto…Recorded three double-doubles…Recorded at least one blocked shot 12 times and two-or-more blocks six times, including a career-high four blocks on Jan. 16 vs. Minnesota…Recorded at least one steal 11 times and two-or-more steals three times, including a career-high three steals on Jan. 27 @ Indiana...Made his NBA debut on Oct. 21 @ Cleveland, tallying two points, two rebounds and one assist in five minutes…Scored his first NBA points on a dunk with 3:25 left in the fourth quarter…Had nine DNP-CDs and was on the Inactive List 31 times…Also played in 21 games with Lakeland of the NBA G League, averaging 14.0 ppg., 9.5 rpg., 2.7 apg., 2.48 blkpg. and 1.19 stlpg. in 31.9 minpg….Named to the Midseason All-G League Team for the Eastern Conference. CAREER TRANSACTIONS: Was not drafted by an NBA franchise…Signed as a free agent by Miami (Sep. 14, 2014)…Waived by Miami (Oct. 25, 2014)…Played with Sioux City of the NBA G League (2014-15)…Played in Turkey (2015-16)…Played in Greece (2016-17)…Signed as a free agent by Orlando (Jul. 27, 2017)…Played with Lakeland of the NBA G League (2017-18). INTERNATIONAL CAREER: 2016-17: Played in Greece with Olympiacos…During EuroLeague play, appeared in 37 games (21 starts), averaging 7.3 ppg., 5.6 rpg. and 1.0 blkpg. in 18.0 minpg., while shooting 62.4 percent from the field…In 33 games during Greek Basket League play, averaged 5.7 ppg. and 5.0 rpg. in 15.7 minpg….2015-16: Played in Turkey with Usak Sportif…In 32 games, averaged 10.5 ppg., 9.1 rpg. and 1.3 blkpg. in 27.0 minpg. Played in 69 career games (53 starts) during three seasons at both the University of Pittsburgh and the University of Nevada-Las Vegas, averaging 8.9 ppg., 7.8 rpg. and 3.06 blkpg. in 25.4 minpg…Named Mountain West Defensive Player of the Year in both 2012-13 and 2013-14…Was also named Second Team All-Mountain West Conference in 2013-14…As a junior (2013-14), played in 33 games (32 starts) with the Rebels, averaging 11.5 ppg., 10.2 rpg., 1.2 apg. and 3.76 blkpg. in 31.4 minpg., while shooting .510 (125-245) from the floor…Led the team in rebounding and blocked shots…Ranked second in the Mountain West Conference in blocked shots and third in rebounding…During his sophomore campaign (2012-13), played in 26 games (15 starts) with UNLV, averaging 7.2 ppg., 5.7 rpg. and 2.62 blkpg. in 21.8 minpg., while shooting .563 (67-119) from the field….During his freshman season (2011-12) at Pittsburgh, played in ten outings (six starts), averaging 4.4 ppg., 5.0 rpg. in 15.0 minpg….Transferred to UNLV following his only season with the Panthers. 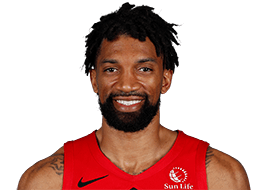 Full name is Khem Xavier Birch…Native of Montreal, Quebec, Canada…Has four brothers…A member of the Canadian Men’s National Team…Also played with Canada’s U-18 National Team, where he captured a bronze medal at the 2010 FIBA Americas Under-18 Championship…Named a McDonald’s All-American in 2011…Spent the 2014-15 campaign with the Sioux Falls Skyforce of the NBA G League, averaging 11.1 ppg., 9.5 rpg., 1.2 apg., and 1.8 blkpg. in 52 contests…Named to the Futures All-Star Team in 2015.…You can follow him on Twitter: @Khem_Birch.